Talented child actress Kim So Hyun lend her sweet soothing voice for the latest OST of her drama Suspicious Housekeeper. 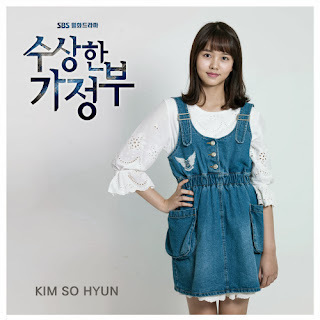 Kim So Hyun is currently playing in this drama as Eun Han Gyul, the oldest child of Eun Family who has to deal with the sudden death of their mother and the mysterious housekeeper Park Bok Nyeo (Choi Ji Woo). She also finds out about her father's infidelity which indirectly caused her mother's death; but gradually with the help of Bok Nyeo, she begins to open her heart and slowly accepts her father back into the family. She's a really loving eonni to her sweet youngest sister Hye Gyul; and a great noona for her 2 younger brothers Doo Gyul and Se Gyul. Shin Woo Ji (Park Ji Bin) really likes Han Gyul, but unfortunately it's one-sided love as she only loves Choi Soo Hyuk (Seo Kang Joon), who (I believe) is her first love.